Organic granola with coconut and chia seeds. This delicious organic granola is made with organic rolled oats, coconut and chia seeds. 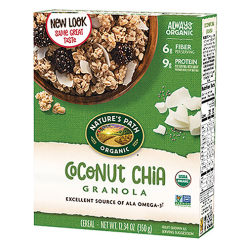 Consumers number one choice for an organic breakfast in the US, Nature’s Path is a leading provider of healthy cereal, granola and snack products. All products are certified organic. Nature’s Path offers a tasty range of cereals containing ingredients such as chia, hemp and buckwheat that boost nutrition by providing plant-based protein, fibre and omega-3 alpha-linolenic acid. Many of its cereals contain superfoods and some are suitable for vegans. Organic berry farmer Rupert Stephens taught his son Arran, the founder of Nature’s Path says leave the soil better than you found it. Those words have been the motto of Nature’s Path since it started making tasty flakes in 1985. They are also the reason the company is passionate about organic, community-minded and sustainable farming. Some 78% of ingredients used in the products are sourced in North America, the home of Nature’s Path. The aim is to be good to people and ecosystems. The seed of Nature’s Path was planted in the 1930s, when Rupert inherited the 89-acre family farm, Mountain Valley. Facing financial hardship, he used inventive farming methods, such as using sawdust as mulch. The result was rich crops and the publishing of a book entitled Sawdust is My Slave in 1951.